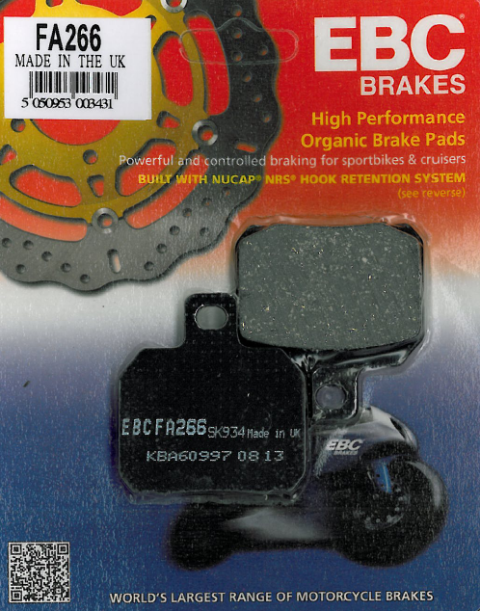 Just for the record last week I changed rear brake pads at 27.200 kt. (16.900 miles). Took the pads to the limit, quite frankly. 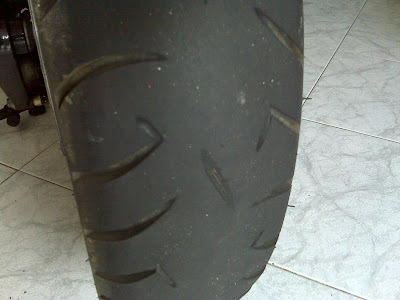 Rear tire at 26.450 kt (yes, another Pirelli Sport Demon). Me likes that tire and I remain faithful. And yet again I ran the tire right through to the wire. Frankly, the weather was being so nice that I wasn’t minding riding along with a slick — but not wire folks! Was keeping a close eye on it and from one day to the next WIRE SHOWING. By my count the tire lasted 13.232 kt (8.222 miles). Have to be carefull with these important safety items. Pirelli Sport Demon beyond the limit! Brief report from Mal in Australia about his battery replacement on his V7C. Sounds like an interesting, albeit expensive option. A Wopping $ 274.30 (Australian $ I think)! That gets me about 4 regular batteries, which multiplied by a fair 3 years per battery, amounts to alot of battery years. 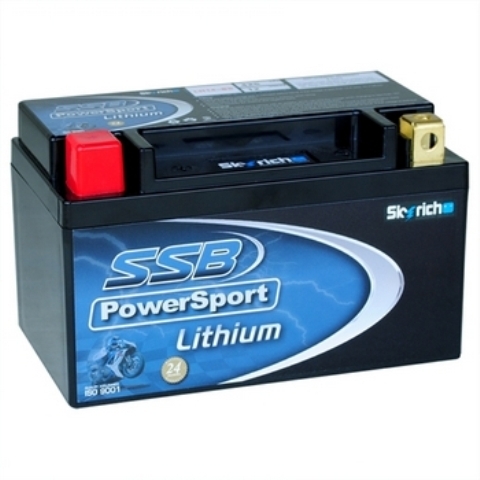 After having to push-start the V7C one cold morning (on a trip) a couple of months back, I replaced the original battery (after 2.5 years & 68,000k) with an SSB Powersport lithium (model LH14-BS). A bit expensive, but 425 CCA, longer lasting, rechargeable with standard chargers, 1.1kg & about half the size – comes with feet to lift it up, but thinking about making a shelf underneath to store stuff. So happy, have them on all my bikes now. Supposed to be able to leave them for a year without loosing charge. I no longer check the battery & recharge after leaving a bike for a couple of weeks. Plug & play. I’m in Sydney & get them from Batteries Direct. Here they go. 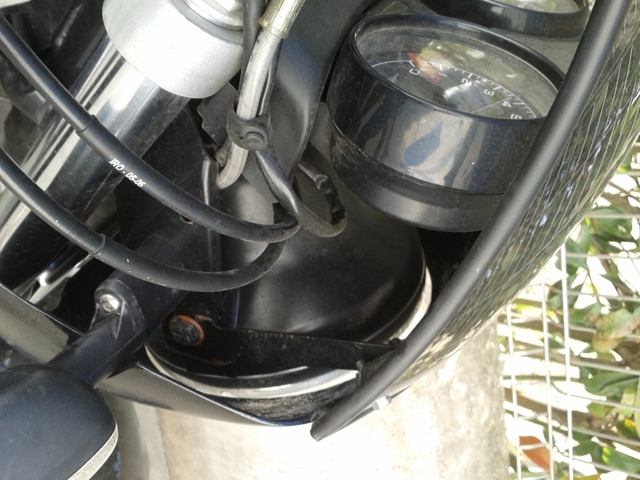 Some bad pictures of how the LeMans I fairing hooks to the Breva 750 headlight system. The way I purchase it at Classic Co., Madrid, Spain, (who, by the way, are simply terric and super-knowledgable Guzzi folk), the set up came with 1) screen, 2) fiberglass headlight cover (unpainted), and 3) two hook-up metal brackets. I don’t remember if it came with bolts and washers but knowing Mauro at Classic Co. they probably did. At any rate it is a simple set up and very solid. 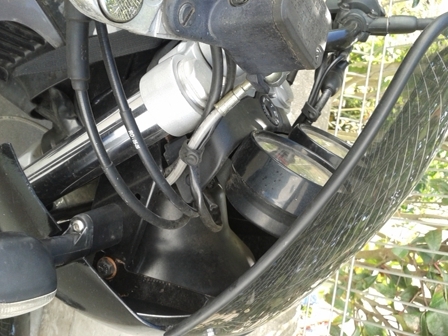 Remember that you have to cut the fiberglass light cover to size so it fits the Breva 750 because it is shorter than the LeMans so the fiberglass going over the light signals will touch the tank unless you cut to size. This is the part that requires a bit more patience as you have to fit and try and fit and try. Otherwise this is very simple. Been thinking lately about some safety issues concerning wearing gear some of the time, all of the time, etc. I know this ranks just short of oil threads, yak fat, kool-aid, small block envy and other forum basic squabbling issues. But for once that I’m thinking, what the hell. Lately I’ve been wearing less gear most of the time (LGMT). I mean riding around town, commuting to work (about 5 miles each way) and, I confess, stopping for the occasional beer now and then (we’re a gregarious and sociable bunch here in Spain, you know, though our Troopers aren’t social at all!) I don’t mean to belittle this issue: When I say a beer I mean one or two beers max, just chatting with some friends after a ride and then just getting home practically down the street. (And, yes, an accident could be waiting to happen just around the corner 🙂 ). I’ll also confess that I’ve always been very safety-minded and take my safety gear very seriously as well as my riding. Touch wood, I’ve been a lucky rider for a few years now and continue to enjoy riding very much…except that I’m wearing less gear most of the time. I know, I know, it’s common sense and we’re all adults here (most of the time 🙂 ). Just wondering how you guys deal with this gear issue. What do you wear, how often, in what conditions sort of thing? 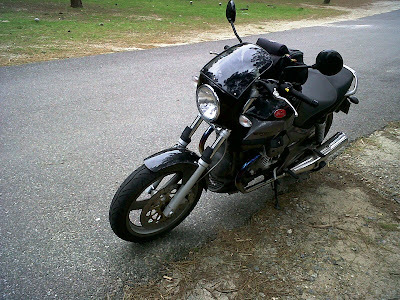 You can see the rest of the thread and opinions at the Wildgoose Chase Moto Guzzi forum. Interesting information. 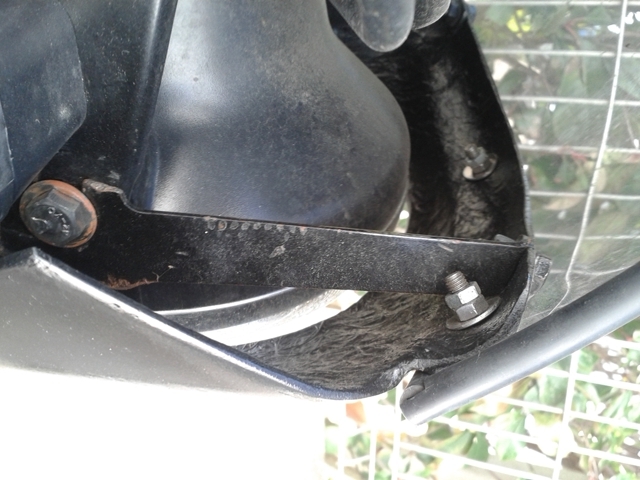 More on the magic fairy – I mean fairing! Turns out, by design or luck, that the LeMans fairing actually worked on that bike if we remember that at one time loooong ago that was a hot, fast bike. The fact that the same fairing would have a similar effect on the Little Breva was icing on the cake. Every single time I ride the bike I am reminded of that. Legal speed limit here in Spain is 75 mph, so you go to 85 mph before the boys in uniform and the radars start rubbing their hands. At those speeds I really appreciate that little fairing, and I would venture to say that you might actually gain a couple of miles per hour with it, or at least it seems so because there is no buffeting. I hope the DART works the same way, though from the pictures I think it lacks the slight curvature of the Lemans I fairing. Also, it lacks the bottom cover of the fairing that surrounds the headlight and passes just past the turn signals. 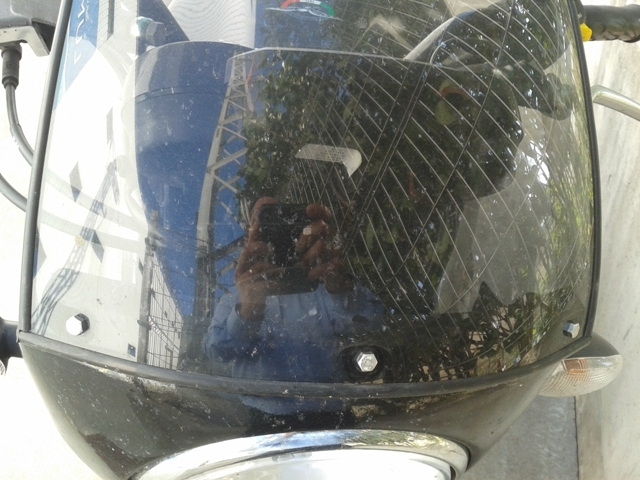 So it may be that it is not the glass part of the fairing alone that works, but the entire fairing itself. Coming back to the 750, with a seat height of low 29 inches, Guzzi is clearly aiming for the city riding/ street bike market. With a 90 degree angle to the knees and a almost upright position, you should be able to drive it all day long. The flat curve of torque means that the 750 is a pleasure to cruise in highways just as it is for fun in city driving. But that also means it will give you adequate ammount of adrenaline rush. Handling will obvious be a first rate (c’mon, its a Guzzi) and anyway Guzzis always have a rock solid center of gravity. Ride quality again cant be compromized, so it has the smoothness of the Marzocchi suspension system. For better efficiency, the bike is fuel injected. And better still, Guzzi sticks with its shaft drive system which means you won’t be lubing a chain every 500 miles and Guzzi has made it sure that you can go out for weekends with the 18 litres fuel tank. But lets not forget that going for a weekend, you may need something extra. So Guzzi will give you that. For accessories, you can order a windshield, center stand, tank and rear bag systems, a low profile seat and a rear suspension kit. So its customized. A customized bike with all that you NEED in a very good bike. It looks I am almost doing a promo for the Breva V750! via Keeping it Simple – The MOTO GUZZI Breva V 750. *2000-2001 V11 Sports have a shorter wheelbase than either the preceeding Sport 1100, or the subsequent V11 Lemans. 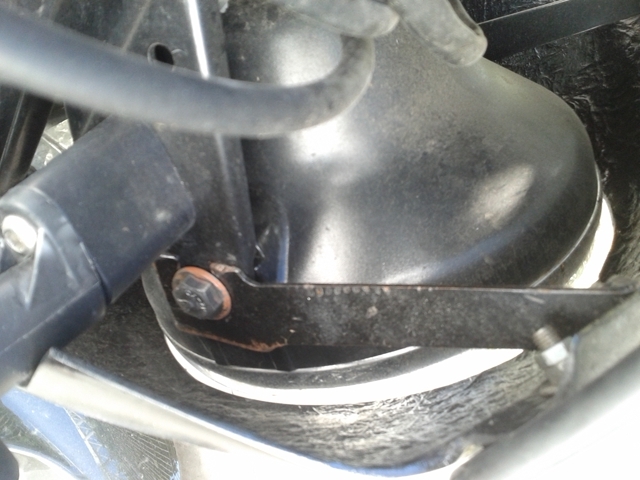 They also have clipons mounted below the triple clamp and a 4.25″ or 4.5″ (can’t remember right now) rear wheel that requires a 160 or 170 mm rear tire. *Some 2001 and 2002 models came with a single-plate clutch. (Rosso Mandello, Scura, and Tenni, IIRC). The dual-plate clutch is more desireable. *2002 bikes had ugly, peeling black engine paint. 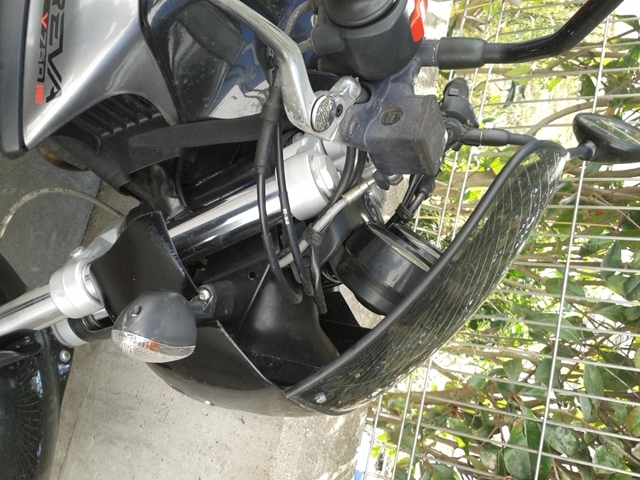 *’02-’04 LeMans bikes have clipons above the triple clamp and 1/2 fairing. They have a 5″ rim that accepts either a 170 or 180 mm rear tire. They also went back to the chassis geometry of the Sport 1100i/Daytona RS. *Ballabio, Cafe Sport, Coppa Italia have a “fixed-mounting” bikini fairing and Renthal tubular bars. *Scura, Cafe Sport, Coppa Italia, Rosso Corsa, Nero Corsa came with Ohlins suspension front and rear. 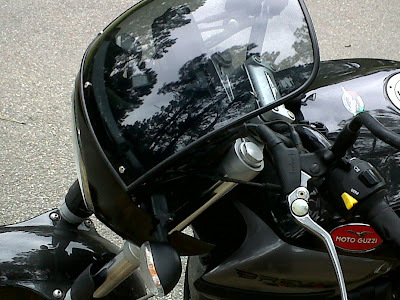 *The ’03 and ’04 bikes have black-faced ITI speedos. The odometer/trip odometer gears wear out on these requiring repair, or replacement of the entire instrument. *All of the V11s can have shift-system spring failures in the transmission. There are two springs on the pre-selector gearset. One centers the shifter. The other helps select the gears. Both are easily replaceable if they fail. *They’re all pretty nice bikes, but the ’01 and ’02 bikes will probably have the most issues, if they’ve not already been dealt with by the previous owner. *’03 and ’04 bikes were well sorted. Red Light ! Out of Oil! Where does the oil go?